The gray bearded and bespectacled Charlie Parr is not exactly the person you would envision tearing up city parks on a skateboard like some stoner kid in Vans. 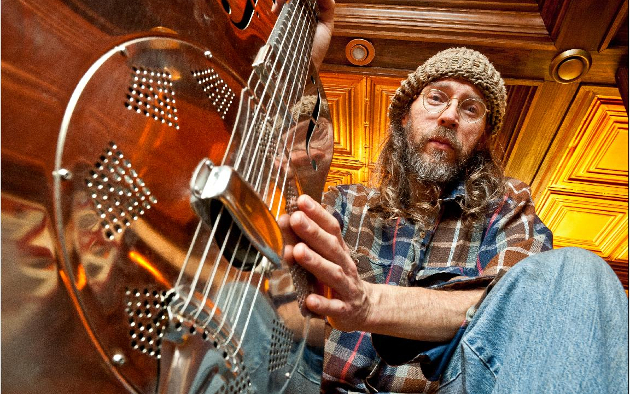 Instead of sliding down hand rails in front of office buildings, Charlie Parr’s usually caught out in the wild performing as one of the most world-class slide and fingerpicking dobro resonator players in existence. Nonetheless, when performing his other job as a world-class dad by precariously perching himself on a board with four tiny wheels in August, he waxed out, breaking his right shoulder, and badly. At first the concern was Charlie Parr may never play again. His shoulder was broken in three separate places. But after waiting for the swelling to go down, Charlie had surgery to install a bionic shoulder—a.k.a a metal plate and eight long screws drilled into his bone. The surgery was a success, and after a 10-week recovery, Parr is now ready to hit the road again. “I was spending time with my kids. No regrets,” Parr says. In November and December the Duluth, Minnesota-based will be touring with Willie Watson and The Ghost of Paul Revere through the Northeast, Midwest, and the out to the West Coast. He’s releases some 13 albums in his career, including 2017’s Dog, which was well-praised by Saving Country Music. His upcoming tour dates can be seen below. #stonershoegate…we need a fancy grad student dissertation on the evils of that assumption . I’ve played a few shows with Charlie and he is also known to be sportin’ PF Flyers highs on occasion. Kind of a sneaker tramp. If I can see one show a year I’ll take Charlie Parr every day of the week and twice on Tuesday. Whatever shoes he was wearing, he’s a stronger man than I! Takes a while to heal a broken shoulder, this speed-recovery sounds almost fantastical, esp with surgery. Wow. Hope he is doing ok.